The NFL Draft is April 26-28 and the Ducks have three players expecting to hear their name called. Painfully, that is three more than last year. 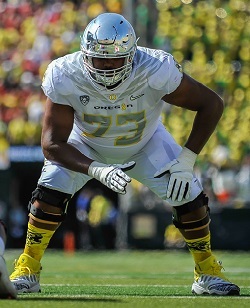 1) Tyrell Crosby: The fifth-ranked OT is expected to go in rounds 2-3, and is rated has having a chance to become an NFL starter. 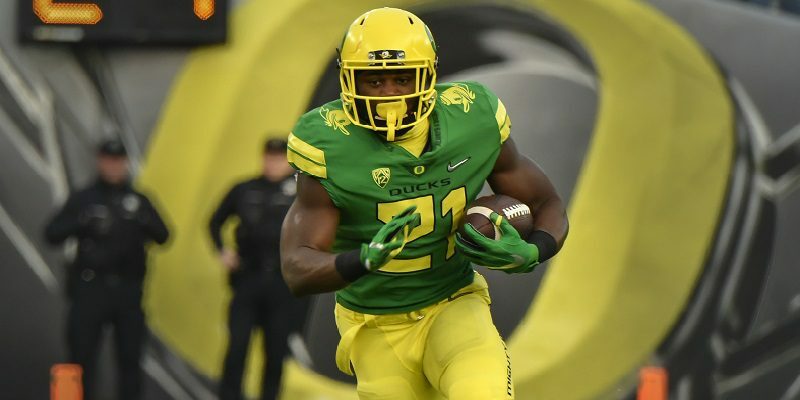 2) Royce Freeman: The eighth-ranked RB is expect to go in rounds 3-4, and is also rated as having a chance to become an NFL starter. 3) Tanner Carew: The number-one ranked Long-Snapper is expected to go in rounds 6-7 and is projected, naturally, to be a Special Teams contributor. Of note, only three LS’s have been drafted since 2010.
land, there are a whopping five schools with new coaches, which makes things seem a bit shaky as the conference attempts to turn things around in 2018. B) Five Pac-12 schools — Arizona, Cal, Oregon, UCLA, Washington — have a quarterback, the other seven have question marks. Mix this with the new coaches and it makes things a bit dicey at best. Here’s a look ahead to key non-conference games next September that will go a long ways in setting the tone for the 2018 Pac-12 season (The Ducks, per the Texas A&M wimp-out, are unfortunately left out of the fun). If the new coaches and quarterbacks don’t have it together, it will be a painful first month of the 2018 season for the left coast conference. These 10 non-conference games — because of the quality of the opponent — will mold the perception of the conference for the remainder of the season. Oregon Basketball should (better) be in the Top-25 next year. Really, only Oregon and UCLA look like top-25 teams — both with outstanding recruiting classes — with USC and Arizona State on the fringe. Arizona, the conference’s flagship program, is in trouble. One analyst said they don’t even rank in the top 50 for next season. While Arizona being down will hurt the overall strength of the conference and cost the Pac-12 money, the flip-side is that it opens the door for other programs to control the conference. Kind of how the Chip-led Ducks swept up the conference in football after the power vacuum that occurred with the fall of Troy. Key Reserves: Victor Bailey Jr., Paul White , Abu Kigab, and incoming freshman Miles Norris. 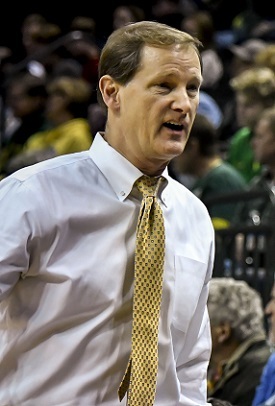 Furthermore, with Keith Smith transferring, the Ducks currently have three scholarships to offer for next season. Arizona decommit and five-star prospect Brandon Williams is scheduled to visit Eugene April 13-15th. You might be seeing green in this Pac-12 logo, but the Pac-12 isn’t seeing green. OUCH! The “12” in Pac-12 almost stood for twelfth place. No bueno. Green vs Purple, Eugene vs Seattle. Duck vs Dog. Good vs Evil. Salt of the Earth vs Arrogant Expletives … and now: Nike vs Adidas. Last week, Adidas signed Washington to a 10-year, $120 million deal. Hence breaking up Nike’s northwest monopoly, and it currently stands as the seventh-largest apparel deal in college athletics. What do Oregon fans think about this? Did you want the Huskies to continue dawning the swoosh, hence continuing to line the pockets of our mega suga-daddy Phil Knight? Or, were you more prone to thinking to hell with the Huskies, let ’em go Adidas, and lets throw more gas on the fire of this great northwest rivalry? I say, let’s burn the expletive place down.